As a designer you have either drawn your ideas or used CAD software to help give an idea of a 3-D image of your vision. However, whichever method you have chosen nothing can begin to take shape without the assistance of a specialist Pattern Cutter. At Plus Samples UK we have thirteen years’ experience of turning your vision into the reality and because we know the specialisms required we only employ the best to perform this highly skilled job. Pattern Cutting not only requires creativity, it demands an understanding of the human form and the way in which we move, as well as a comprehensive knowledge of fabrics, their feel and flow and which will or won’t work well with specific designs. Our Pattern Cutters also know how to get that perfect match when the segments are sewn together. This is an underestimated skill but an essential one because each fabric handles differently and an inexperienced cutter may not understand the nuances which make some fabrics behave differently from others. Because of this, the Pattern Cutter really is your best friend, and at Plus Samples UK we encourage you to build a relationship with our team so that together you can create a garment which will meet your expectations and that of your clients. The quality of the Pattern Cutter will hugely effect their ability to interpret your sketch and therefore the final look of the garment, so we take our responsibilities very seriously and make sure we employ only the most qualified and experienced cutters. Part of the process we undertake is the production of at least one toile to check the shape, proportions and the balance of the garment. This allows you to see what your design will look like in fabric, an essential part of the process as you might find your design doesn’t look as good in 3D form as the 2D (flat) paper design. While the aesthetics of any garment are important, fit triumphs everything, for without a good fit, you haven’t achieved a good design. Naturally, there is a price for all our experience and knowledge, but to reassure you that we really do know what we’re talking about we offer an initial free, no-obligation consultation, which is a great opportunity to get to know each other. For us it’s the opportunity to understand your vision, for you it’s the chance to meet our Pattern Cutters and learn what it is that makes us the best at what we do! 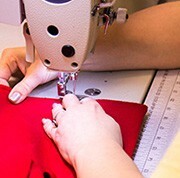 If you are looking for a UK Garment Manufacturers with cutting-edge knowledge and thirteen years’ experience in the business, then you need look no further. We offer a one-stop-shop for all your garment manufacturing needs and are at the end of the line, phone or tube, with no waiting up until 2am to make that call and no language barrier! Plus Samples Ltd is a London based studio catering for small or medium volume ready-to-wear garment production. The great thing for you, the customer, is over time we have learned what it takes to be the best and we are confident that our production process won’t disappoint. From the minute you contact us we are here to listen to your requirements and find a solution that works for you, whether it’s Cut, Make and Trim or garment development, we want you to be completely satisfied with our work. If you have a vision and want to make sure that it becomes a reality you need a garment manufacturer who understands how to turn the concept into the finished article. Our pattern cutters are experienced, specialised and creative, which means they can interpret the vision and translate it onto a paper pattern allowing for all the technical aspects of stitching a garment. Our pattern cutters work closely with our sample makers, keeping your business in-house ensuring a seamless process throughout. Sampling can be seen as expensive but as well as giving you, the designer, something to show to potential clients, it is an essential part of the creative process, identifying problems and hiccups during the early stages of the production process. Naturally, for you the designer the most exciting part is when we move from the paper pattern to the development of the actual garment. This is where the dream starts to become a reality and we always get a thrill watching the reaction when a finished garment is shown for the first time! Once you are 100% happy with the product and it meets all your expectations of fit, design and detail, we will then discuss with you your grading requirements and, unlike many companies, offer you a choice of digitally or manually graded patterns. We work with a number of high-end men and womenswear designers and have had our garments showcased at London, Paris and New York fashion weeks. Our testimonials speak volumes, but it’s our products that make us the UK garment manufacturer of choice.